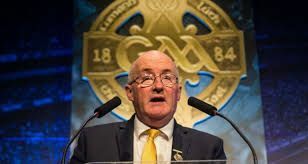 We are delighted to announce that the President of GAA John Horan will be in attendance as Guest of Honour at our upcoming 'Celebrating Sport' event. This much anticipated event will take place in the College on Thursday 27th September at 7.30pm. We will take the opportunity to recognise the achievements of our sportsmen in the previous academic year across multiple sports, achieved in the famed blue jersey. Specifically we will be honouring Ulster winners in Hurling, Swimming, Handball, Cross Country and Athletics. We will also be recognising success at All Ireland level in Athletics. Last year one of our Cross Country teams reached an unprecedented milestone qualifying for the International Cross Country Championships in Paris. The team performed remarkably at this event. We look forward to celebrating the brilliance of our pupils, in the company of their hugely supportive and dedicated parents. Not least we are looking forward to recognising the invaluable input of our staff in preparation of our teams.